73cm x 90.5 cm. Oil. Signed "Descarsin, painter to Monsieur, brother of the King 1791"
This lovely painting was acquired by the Musée de la Révolution Française, Vizille in 2004, having recently come up for public auction. A piece of political propaganda certainly, but as an unpatronising portait of two ordinary people, it shows the legacy of the Revolution at its best. 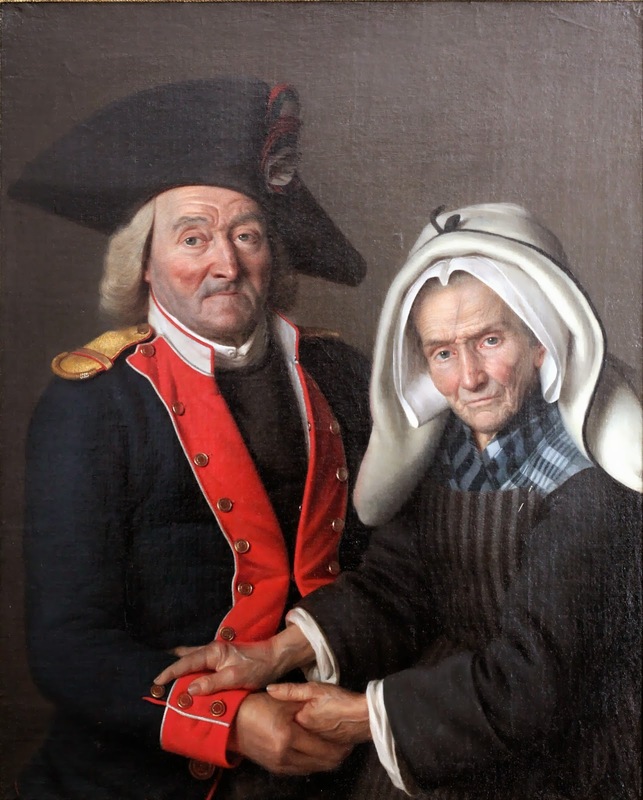 A married couple, aged more than a hundred ("plus que centenaires") from the former diocese of Angers, named René Dogereau or Degro, and Perrine Trouillard, were living near the former Hermitage, in a state of abandonment and distress. The Amis de la Constitution, who had heard about them though their inquiries after recommendations for public charity, awarded to these old people a pension which would continue to to be paid to whichever of the two remained living. To give them an idea of the Revolution, which they could not expect to enjoy for long, they dressed them up in clothes in the three national colours. The Compagnie des Adolescents then fetched them and took them to the Theatre, to performances of The Family Supper and The Three Farmers which were put on in their benefit. Dogereau, had been a wine grower, a ferryman and finally a caulker of boats. He died a short time ago but his wife is still alive and still has the use of her senses. p.581-582.